Just ask Brit, who has jumped around in time with such abandon that she has to coexist with multiple versions of herself. Now, Brit the Elder finds that her memories don’t match Brit the Younger’s. And there’s the small matter of a glitch that’s making Brit the Elder’s body fritz out. Brit the Elder’s ex-boyfriend Phillip wants to help her, but he’ll have to keep it secret from his current girlfriend, Brit the Younger, who can’t stand her future self. Meanwhile, Martin is trying to protect Phillip from a relentless attacker he somehow hasn’t noticed; Gwen is angry because Martin accidentally proposed to her; Gary tries to help the less fortunate, with predictably disastrous results; and an old nemesis might have to be the one to save them all. 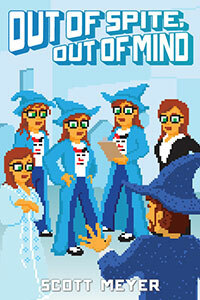 In Out of Spite, Out of Mind, our fearless wizards discover the biggest glitch in their world’s program may well be themselves.